By Janemarie Mulvey Ph. D.
Numerous delays in the new health reform laws implementation have left many small businesses confused about what they have to do and by when. This detailed guide deciphers and simplifies the requirements of the Affordable Care Act for small businesses. The next few years are critical for the implementation of the Affordable Care Act. After numerous delays, many small businesses are scrambling to figure out what the law requires of them - but the answers to their questions are buried in thousands of pages of complicated regulations. Many small businesses who do not file the required forms with the IRS in 2016 face fines of $250 per form (capped at $3 million). Others may face additional penalties of over $2,000 per worker for not offering adequate or affordable coverage. Now Janemarie Mulvey, PhD-a former economic advisor to Congress during the enactment of ACA and former chief economist for the Small Business Administration-is offering small businesses timely, unbiased information about the ensuing implications of the health-care reform law. 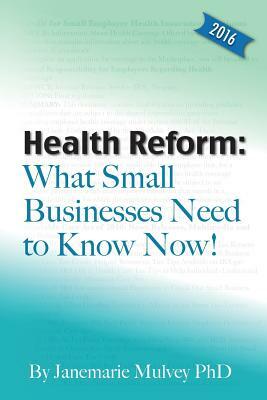 In Health Reform: What Small Businesses Need to Know Now, Dr. Mulvey deciphers and simplifies the new law for small-business owners, their HR staff, health insurance brokers, and legal counsel by providing easy-to-understand explanations, checklists, and links to calculators and other useful resources. Since many of the law's penalties and premium subsidies are implemented through the tax code, this comprehensive guide also serves as an excellent resource for accountants. Find the answers you need to finally understand your new obligations under ACA, and learn how to craft the best strategy for moving your small business forward. Economist and award-winning author Janemarie Mulvey, PhD, has more than twenty-five years' experience in the analysis of health and long-term-care financing, taxation, and retirement security issues. Recently serving as a senior health economist at the Congressional Research Service while the Affordable Care Act was enacted, Dr. Mulvey advised Congress on key issues of the law, as well as the nuances and complexities relating to implementation. She also served as chief economist for the Small Business Administration's Office of Advocacy. Dr. Mulvey holds a PhD in economics from George Mason University, and an MA and a BS in economics from the University of Maryland. Her extensive career includes senior positions at the Urban Institute and the American Association of Retired Persons; director of the economic research departments at the College of American Pathologists and the American Council of Life Insurers; and deputy director of the Research Information Center at Towers Watson.